Sleepwalking, also called somnambulism, is one of the three sleep disorders (nightmares, night terrors, and sleepwalking) where amount of physical activity during sleep distinguishes the disorders. These sleep disorders are characterized by sleep disturbances of varying degrees, and sleepwalking is the most extreme form of the sleep disturbances. Up to four out of one hundred adults sleepwalk, according to the American Academy of Sleep Medicine, and is more common than previously thought. People who sleepwalk may sit up in bed with a blank stare, get up out of bed and walk around, or even perform daily tasks. For example, sleepwalkers might move furniture around, climb out of a window, or urinate in a trash can. The person sits up and walks around, but has a blank stare. When spoken to, sleepwalkers can give strange answers or take a long time to formulate a response. The person seems confused upon waking. The sleepwalker might have a violent reaction when roused by another person. The eyes are open even though the person is asleep. The sleepwalker has amnesia of the sleepwalking event upon waking. The person might walk around and perform complex routines, such as fixing a sandwich or moving furniture around. In rare cases, sleepwalkers will get into their car and drive away. The best way to notice if a sleepwalking episode occurred is if there is evidence of the nighttime activity, such as food being left out, dirty dishes, or objects moved out of place. At what point sleepwalking occurs helps clinicians distinguish sleepwalking from other sleep disorders. Most commonly, sleepwalking in adults occurs during slow wave sleep, which comprises the first third of the night. When sleepwalking-like symptoms occur during the rapid eye movement (REM) phase of sleep, it is referred to as REM sleep behavior disorder. Moreover, in REM sleep behavior disorder, people will often remember the physical movement during sleep and the dream that caused them to move about. The causes of sleepwalking are not known. However, there are various factors that are thought to contribute to developing this behavior. Sleepwalking can have emotional origins. According to the National Sleep Foundation, people with other mental disorders (depression, anxiety, and obsessive compulsive disorder) were found to have more frequent episodes of sleepwalking. People with depression had three and a half times more episodes of sleepwalking than people without depression. People with obsessive compulsive disorder had sleepwalking episodes four times more than people without the disorder. Stress and highly charged emotions were associated with increased episodes of sleepwalking. Post-traumatic stress disorder is associated with higher incidences of sleepwalking. 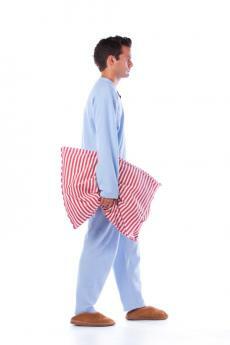 At times, environmental situations could trigger sleepwalking events. A change in sleep schedule. Irregular sleeping habits and patterns. Interruptions during sleep, such as having to get up to go to the bathroom or a noisy environment. Other factors cause sleepwalking symptoms and are organic in nature. According to EMedicineHealth, these physiological and medical conditions can contribute to sleepwalking. Some medications, including prescription and over the counter medications, are known to encourage sleepwalking behaviors, as well as alcohol. Alcohol and antihistamines can also encourage sleepwalking behavior. There is evidence that sleepwalking could have a genetic component because it runs in families. Approximately 30% of individuals who had sleepwalking events also have family members who were known to sleepwalk. The major risk of sleepwalking is inadvertent injury, or injury to a bed partner, such as nosebleeds, broken bones, and bruising. Moreover, one study found that physical injuries occur in over half of sleepwalkers, necessitating the need to take sleepwalking incidences seriously. It can be extremely difficult to wake up a sleepwalker. When they do wake up, they can be very confused. Normally they would have no memory of the entire event, so waking up in a living room instead of the bedroom can be highly confusing. It is very rare to have a clear memory of everything that happened. At times, the sleepwalker may attack the person attempting to awaken him or her. This can, in some very rare cases, result in crimes being committed while sleepwalking. Slowly guiding a sleepwalker back to bed is a safer, and often easier, strategy. In most cases, the sleepwalker will just go back to bed and continue sleeping peacefully. Stick to a regular sleep schedule. Try to go to bed and get up in the mornings at the same times every day to avoid fatigue and sleep deprivation. See your doctor for a physical checkup. This will rule out any health conditions that could cause or worsen sleepwalking. Ask for a referral to a sleep lab to rule out other sleep disorders. Sleep apnea has been linked to sleepwalking, and it is important to treat this condition immediately if there are signs you may have it. Make sure you sleep in a safe place. Preferably, try to use a ground floor bedroom. If you don't have a choice, lock upstairs windows and balcony doors. Also, lock outside doors to prevent wandering outside. It is important, especially for adults, to get help right away if the incidences of sleepwalking become frequent, increasingly put you into dangerous situations, or cause significant impairment in other areas of your life. You might have an underlying medical condition that could need attention right away. Seeing a mental health professional could be very helpful in treating sleepwalking episodes. Often, sleep disorders have a variety of causes working in conjunction with each other to cause the symptoms. Mental health professionals can help you with the emotional aspects of sleepwalking, as well as assist you in promoting the changes you need to instill good sleep hygiene, such as establishing a regular sleeping schedule, overcoming alcohol addiction, or handling emotional issues.